Al Pacino isn’t a movie star. He’s an actor. And when you put a Lee Strasberg student on a stage before a star-struck crowd, he’s always on. Bringing his intimate Pacino One Night Only show to Toronto’s Massey Hall, the legendary performer took to the stage with a raw, unscripted theatricality that — to most of his fans that grew up with The Godfather trilogy and Scarface on repeat — sparked a stark contrast to the iconic roles of a tightly clenched Michael Corleone or a gun-wielding Tony Montana. After years in the industry, the 73-year-old Oscar winner (for his role as Lt.-Col. Frank Slade in Scent of a Woman) has yet to lose sight of his craft, or the passion he derives from it. “Fame is the perversion of the human heart for attention, for validation,” he explains. He’s having so much fun with himself until an audience member on the balcony asks him to say one of American cinema’s top movie quotes. “Say hello to my little friend!” he finally obliges, paying fan service to the waiting crowd. The growth and progression of one of the world’s best actors is magnified in that small moment of reluctance. A Shakespeare enthusiast and Oscar Wilde buff, Pacino prefers to discuss the literature that has fuelled and stirred his imagination throughout the years. “All acting, all art, is great when it’s personable,” says Pacino, who recently wrote, directed and starred alongside Jessica Chastain (who is sitting, unbeknownst to the crowd, in the front row) in the docudrama Wilde Salomé. 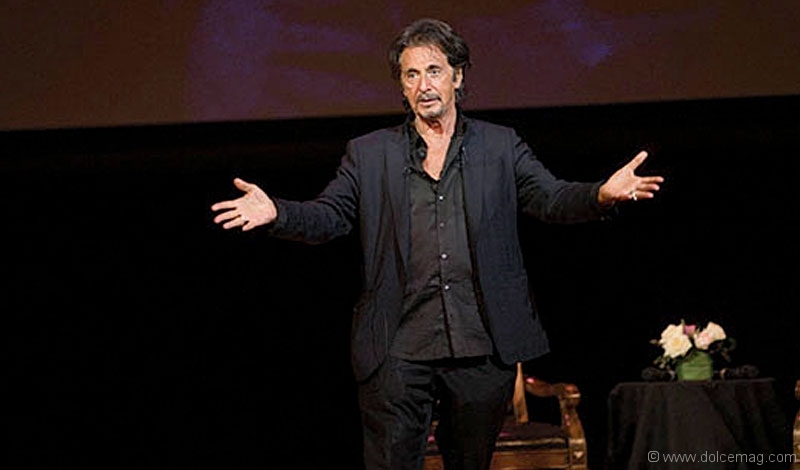 Before capping the night by reciting the Irish playwright’s “The Ballad of Reading Gaol,” Pacino touches on poignant moments that shaped his trajectory. Many are sombre and revealing: life growing up on the crime-riddled streets of the South Bronx; friends dying of drug addiction; his mother, whom he credits for saving his life; the early days of acting, when he was poor, often homeless, curling up on a couch that was both prop and bed with a cheap bottle of wine (though, he notes, he hasn’t touched booze in 40 years). He also delves into his first major role, the one that launched his career: Michael Corleone. Although selected by director Francis Ford Coppola, a choice of which the studio disapproved, Pacino was ridiculed by the film’s production team. “‘Where did Coppola get this kid?’” Pacino recounts. “‘He can’t even walk.’” Pacino would march towards his first of eight Academy Award nominations with that performance.